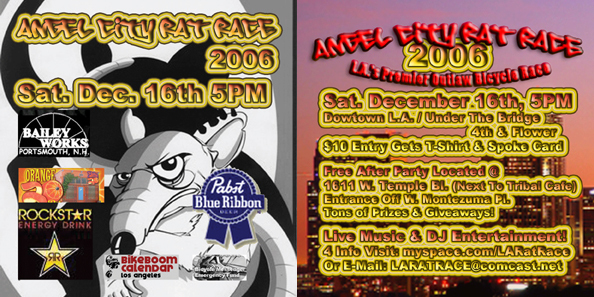 As you know the Angel City Rat Race is less than 10 days away!! Helmets are encouraged but never mandatory. UPDATE: The Entry Fee will offically be $10 if you would like an event t-shirt*, otherwise without a shirt the entrance fee is only $5. We realize that the X-Mass season has left many of us broke and who says a shirt should be mandatory. Afterparty will start bumpin probably around 7-9pm. and wherever these mofo's let us put em! So feel free to leave us a comment, cause we'de appreciate the support. Many have helped, and few will be thanked. SO BE SURE TO SHOW UP IF YOU LOVE ROLEin ON 2-WHEELS! *T-Shirts will now be on time! !